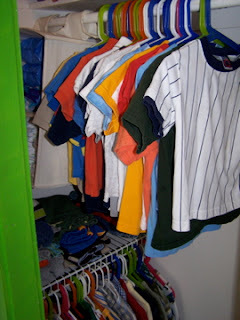 My son's closet was in desperate need of attention. 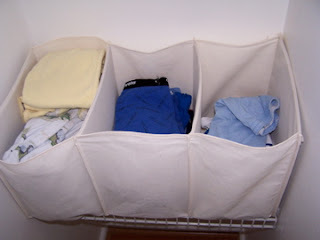 I happened to pick up some odd pieces of a Closetmaid wire closet organizing system off of Freecycle, which was free as all things are on Freecycle. I then bought the wall brackets at Home Depot for 5 bucks and went to work. I installed a shelf on opposite sides of his closet. 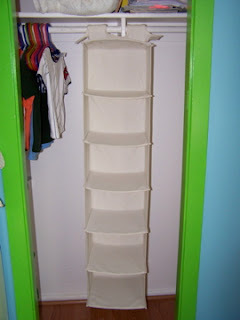 And then I reached a "problem", I need some sort of bin or storage basket to hold all of pajamas on top of the shelf. Immediately I thought like most people : I'll just run out to Target and pick one up. But then I stopped myself...wait i can use what I have and make it work. 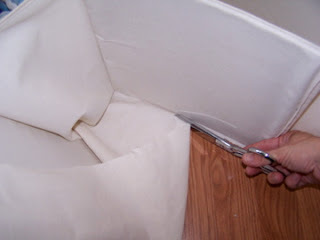 So I took the hanging canvas closet organizer that I already had and cut off the bottom 3 bins. 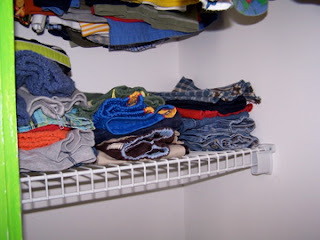 It fits perfectly on top of the shelf and now his pajamas can be organized by season, fuzzy footed jammies in one bin, long sleeve jammies in another and summer sets in the third. And yes for those of you that don't know me, all of my closets are this OCD organized. 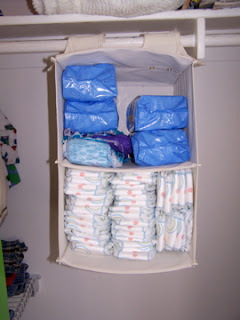 Then I took the rest of the hanging organizer and put diapers and wipes in it so that it can live over the opposite shelf. Here is the finished closet. Not bad for 5 bucks, eh? I was taught by the best!! This was wonderful. Now you need to help your parents.